We create websites for a range of businesses. Plumbers, lawyers, travel companies, there's very few sectors we've not worked in over the years. Every now and again, we get to make a website for a slightly more unusual business. This month, we're wrapping up the new website for Family Tree Bears, run by Chris Elliot. Family Tree Bears are individually crafted characters for the collector, coming with unique clothing and a family history. 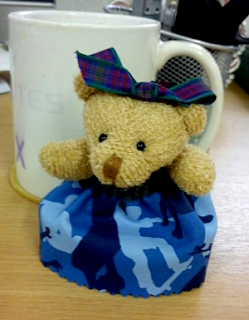 Chris is really pleased with our service, and sent us a miniature one of her bears as a thank you. So without further ado, we'd like to introduce our Toolkit Websites bear, Rosie, named by one of our project managers, Cat. "I don`t see how you could improve! have been impressed by how friendly and helpful everyone I`ve spoken to has been (Jack, Alex, Barnaby) Great, personal support and interest in my site from all staff." Find out more about Toolkit Websites, Web Design in Southampton, Hampshire, UK and how they can help your business grow.